Time for consultation on another Major Cycle Route, and this one is quite a doozy. The South Express (Puari ki Niho-toto) extends all the way from South Hagley Park to Templeton, passing through various suburbs of Riccarton, Sockburn, Hei Hei and Hornby for a total of 15km. Now normally I would take you through the details of the various bits of the proposed cycleway route. But in this case, that would be an incredibly long blog post – the consultation booklet for this cycleway has 133 pages! So instead, I will just highlight some of the key features and a few initial thoughts. Most of it features a two-way cycle path, typically 3-4m in width. Through reserves and more remote areas, the path might be shared with pedestrians, but typically along residential streets there is a separate footpath. To help riders get across some of the busier roads a series of new signalised crossings are being installed. I counted 18 sets of signals being installed or upgraded along the route. 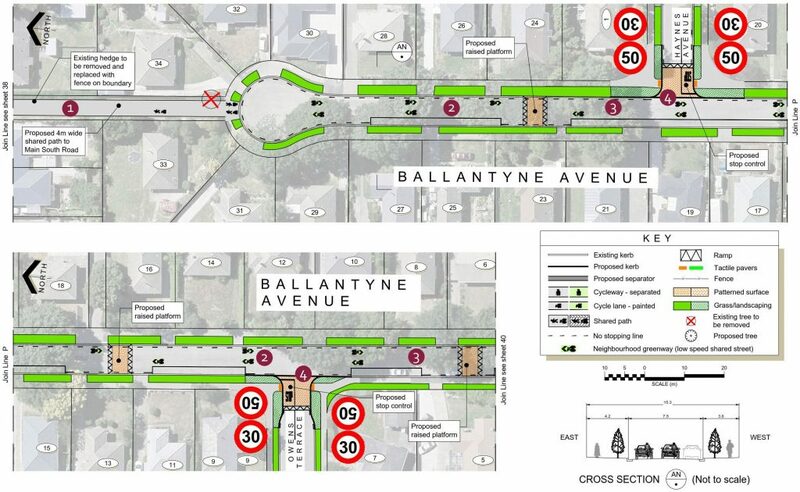 There are a few short sections of neighbourhood greenway (quiet street), some of them aided by some street restrictions. That includes a couple of closures at intersections to create new cul de sac ends. While the original route was nominally indicated as following the railway corridor, generally the final route doesn’t, for two key reasons. Firstly, unlike the Northern corridor, the southern rail corridor doesn’t go near many major destinations like schools and residential areas; the final chosen route connects many of these. 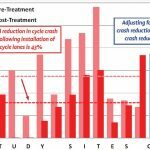 Secondly, it’s getting increasingly harder to run cycleways down rail corridors anyway (as negotiations along the Northern Line extensions are demonstrating). Some of the street crossing points are simply to switch the cycleway from one side of the street to the other; others are where the route heads down a new street. The actual crossing locations often seem rather odd and, coupled with nearby changes of route direction, can result in having to make twice as many sharp turns than seem necessary. Why does this crossing have to be quite so far past Hei Hei Rd? Separated cycleway paths are used quite extensively along the route; understandable for the busier roads, but potentially overkill for some of the quieter sections. For example, Middlepark and Craven Rds in Sockburn have <2000 vehs/day; likewise for Peverel St, Centennial Ave and Elizabeth St in Riccarton. So why not a few more neighbourhood greenway sections, which are typically less expensive to build and result in less parking removal? If a cul de sac is being created, then why do we need a separated cycleway? There’s a lot to take in along this route, and you might only be really interested in part of it relevant to you. Nevertheless, take advantage of the public information meetings, and get a submission in by Wed 3rd April (extended from original due date of 20th March). 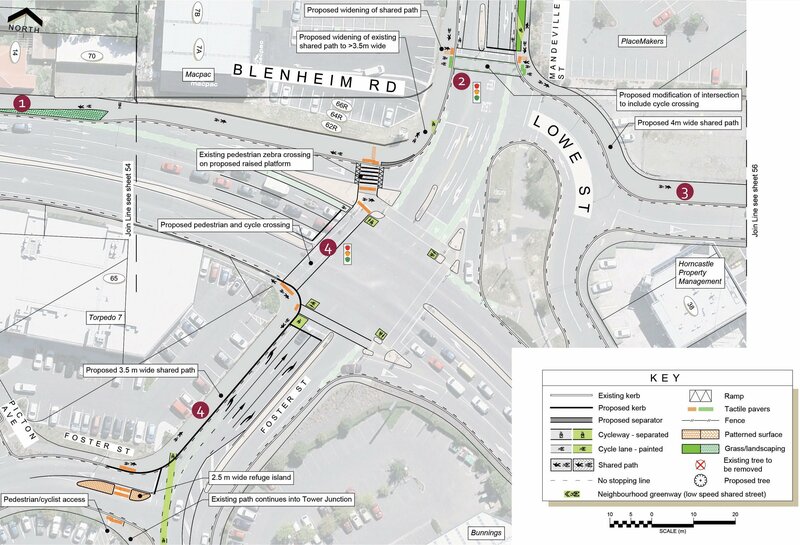 What do you think of the South Express cycleway? Have your say! I ride a lot of this route already – and most of the pain points are intersections and narrow+high speed roads. As a somewhat competent cyclist I don’t want to stop at every road intersection where I can just ride through like the road vehicle I am. * Templeton Kirk Road – this makes it an enormously big intersection, with relatively little space for vehicles. I can imagine over-long vehicles having issues here. This will be exacerbated if the Roydon Quarry gets approval, because gravel trucks aren’t short and they’ve applied to 1500 “vehicle movements” every 24 hours. ANSWER combine the cyclepath crossing with the railway crossing, just like at Northcote Road. Makes for a thinner section, and vehicles travelling between Railway Terrace and Waterloo Road can have a green light for flow. * Avoiding Waterloo Road completely might have been smarter – theres a lot of big trucks, and I’m recalling the 3 near misses I’ve had in 6 months, on that stretch of road. Answer – Use the railway corridor and across the park into Hei Hei Road. I see there’s shared-use pathways AND dedicated on-road unprotected lanes in both directions. * Sheet 13 shows the ridiculous corner with old railway iron rails embedded in the road. Some suggestion this is going to connect to Halswell Junction Road, which would be better than the existing idiotic designer’s ideas of slippery metal rails in the road. This corner also gets cars swinging wide in both directions and the centerline is completely ignored. Corner absolutely needs a redesign. * Buchanans Road is losing a lot of trees. Is it not possible to wind around/between them more? * Buchanans and Carmen Roads are not slow – with Carmen being two lanes each way. Drivers won’t want an additional signalised stop – Answer: why not tie in with the existing lights? Given the traffic, it’s one road that would warrant an overpass or a tunnel like the Harewood/Johns Road one. * Transmission corridor could be very nice – looking forward to that leg. 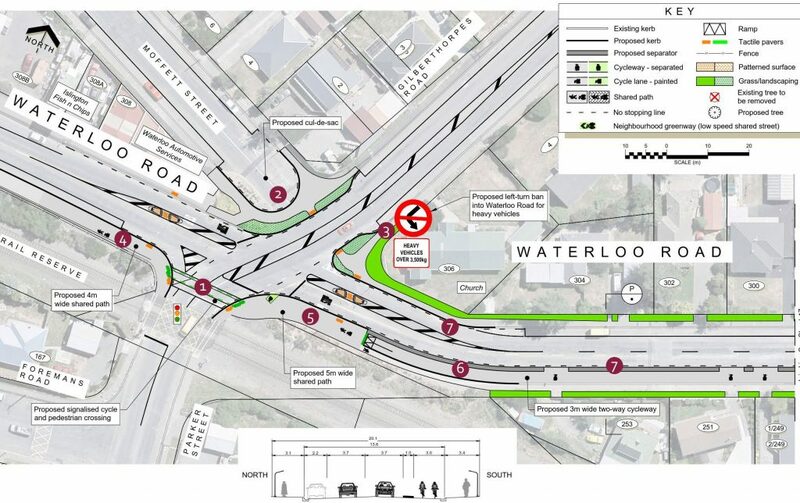 * Main South Road and a bit of Riccarton Road – Could be good, could be terrifying. There is already an unprotected cycle lane here which means some roadway is already allocated. Expect the usual loss of parking whinges. 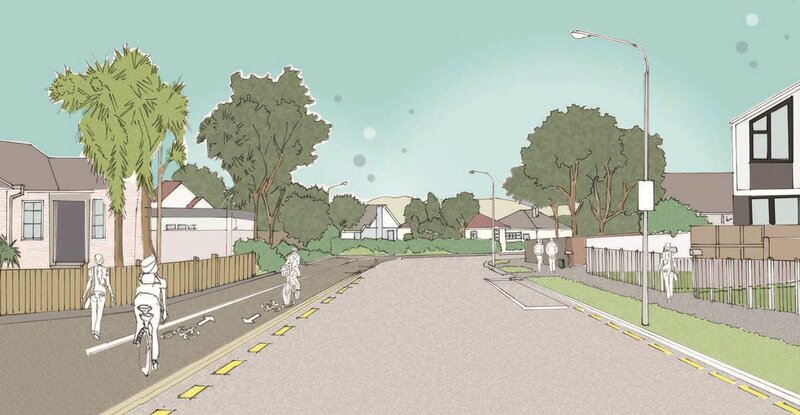 * Through The Back of Riccarton looks nice -I notice Suva Street is all “this is the norwest arc and is shown for information purposes only” Does that mean it won’t happen because its part of the other route? * Middleton Road crossing has to be pretty-low car traffic – why put lights in at all? Leave it as a giveway so I can just ride through when there are no cars. Same as what’s planned for Lochee Rd. * This TTBORicc does have to cross a bunch of main roads at places where there are no crossings or lights. This will annoy vehicle drivers. Clarence Street will be the worst, that road is generally pretty busy. * Elizabeth/Picton – that just feels wrong. Given the east end of Elizabeth will be a cul-de-sac just make the whole area a shared road. 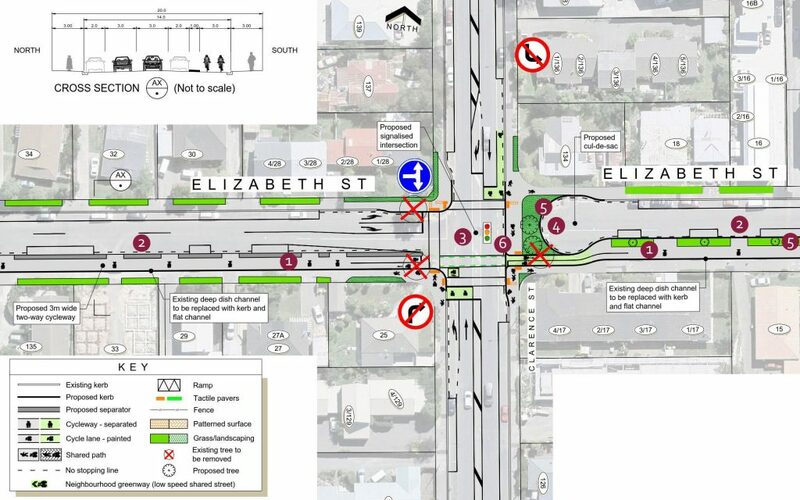 Trying to crowbar a two-way cycle lane in is going to be a waste of money. * Old Blenheim Road railway crossing – does this have to be a horrible double-chicane with the wire fence? Answer: make it exactly like the Uni-cycle crossing, which works well. * Finally why the odd name? – The “SOUTH” express goes mostly Westward? Surely WestExpress would be better given it goes 11.6 km west and only 2.0 km southward. The BIG plus from me is that it avoids the horrid Sockburn Roundabout. That’s an absolute no-fun area to ride. I see that the pathway beyond Templeton has already been started – think its part of CSM2 and will lead into Manion Road and Weedons Road into Rolleston. I’m totally looking forward to riding this route when its open. Bring it! Great feedback, Criggie! 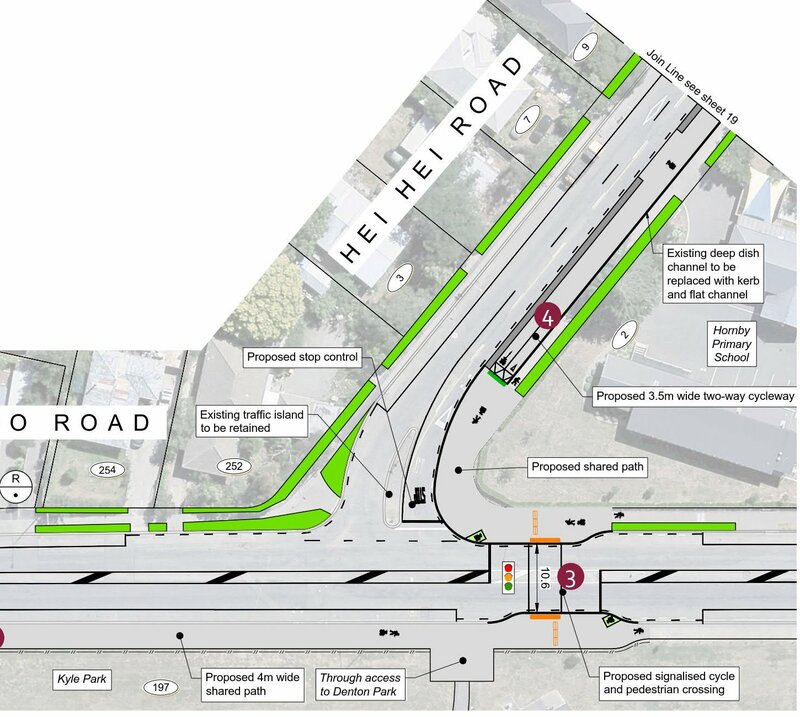 Let me ease your mind about the Norwest Arc bit along Suva St: this is already into detailed design for construction starting later this year (thanks to additional NZTA funding subsidy). So this bit will probably already be built when the rest of the South Express chugs along. The “South”/”West” question is an interesting one for Chch; it is a quirk of our geography that to head south (i.e. towards Ashburton, Timaru, etc) you have to first head west (hence “Main South Rd” mostly travelling west). Given that most cycleway travellers will be confined to the urban area and not planning to head to Ashburton, etc, you have a fair case for renaming the cycleway (is it too late to do that?). I’ve ridden bits of this route this morning and its going to be good. * Small reserve/park between Epson Road and Racecourse Road has a couple of bridges out over the creek. These might turn out awkward because of the lack of space. Perhaps creek needs to be enclosed, buried in a pipe/culvert ? * Main South and Riccarton Rd are going to be a challenge. * Suva Street will be great. * Clarence Street crossing was quiet for me, but in peak traffic its just going to annoy drivers. 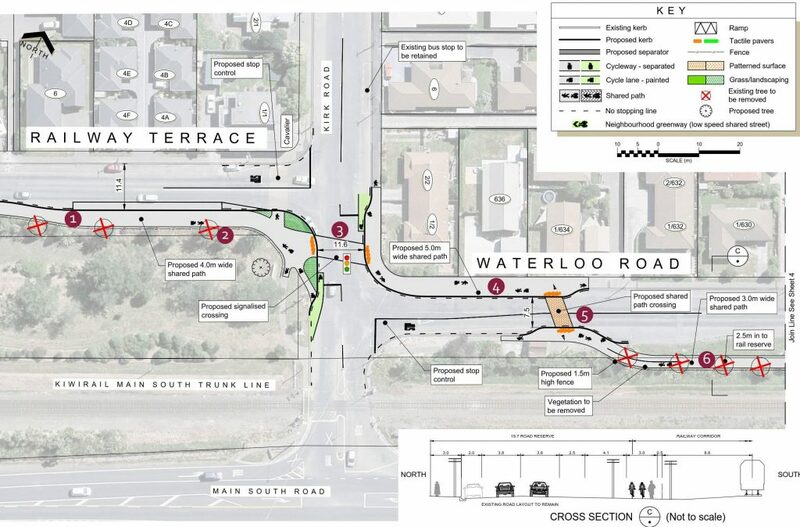 Is there a benefit to moving the crossing down to Blenheim Road and incorporating with the traffic lights? * I still think Carmen Road crossings will cause significant traffic backlogs. This crossing may need to be an overbridge or a tunnel to keep the traffic flowing. 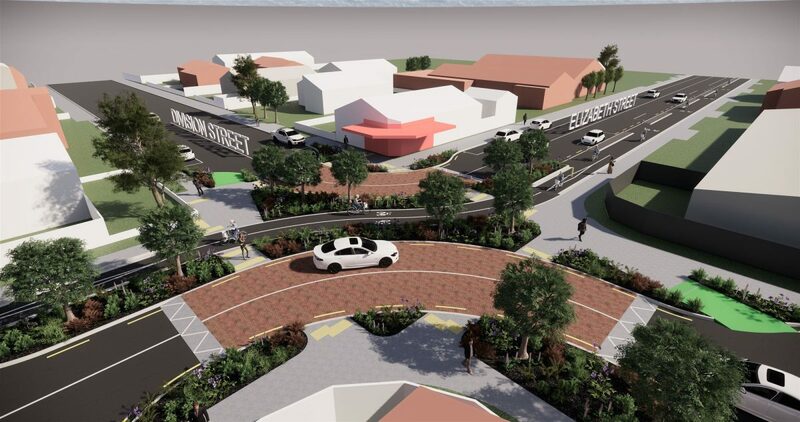 * Not sure about Kirk Road in Templeton – encouraging car traffic to take the main road will be good, but as designed the intersection is just confusing and messy. Running the bike path hard by the railway line there seems worth considering. Yes I went off track at once point. Can’t go down the transmission corridor cos of roadworks/diggers. More segments after the westbound trip tonight. As anticipated, crossing Clarence Street is awful in traffic. Its going to seriously interrupt an already busy through road. The same will happen at Carmen Road which is 4 lanes. I’d seriously lay the case for an under/overpass, specially given its 60 km/h and is also the main bypass road for north/south travel. On the whole, I’m excited by this plan. 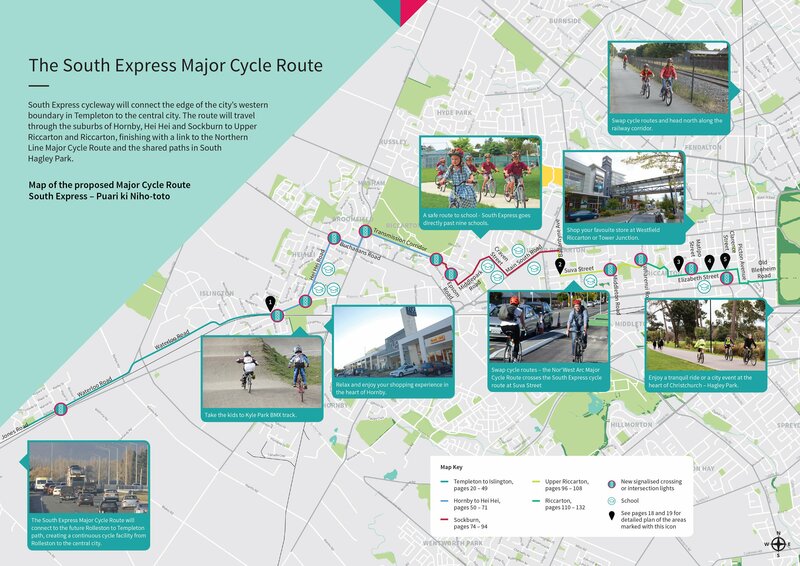 The single biggest thing for me is the big pathway being built right-now beside Jones Road, and intended to tail onto the end of this South-Express route. At 80 km/h that road is a nightmare, plus its narrow, with zero street lighting at night, and there’s a quarry mooted which will bring more big trucks. Previous Previous post: Guest Post: Mind those doors!